A Hillsboro city street crew cut into portions of Gov. Trimble Place on Friday to see whether bricks still existed under the street. They found that the bricks had been removed. When the Plaza Design Committee was working on the look and amenities that would be included if an uptown plaza is built in Hillsboro, some committee members wondered aloud whether the original brick that once existed on Gov. Trimble Place might still be there, under the current street. Turns out, there’s no brick. Hillsboro city street workers on Friday jackhammered through various portions of the street and discovered that the bricks no longer exist, apparently having been removed decades ago when new surfacing was installed. Applegate said Friday she was surprised to learn that no bricks remain under Trimble. “It is disappointing that they spent the money and time to take them out,” she said. Todd Wilkin, Hillsboro safety and service director, said Friday, “At some point, the existing pavers were removed.” He said bricks are clearly visible under the street at the intersection of West Main and North West Streets, and he was hopeful they might still exist under Trimble. 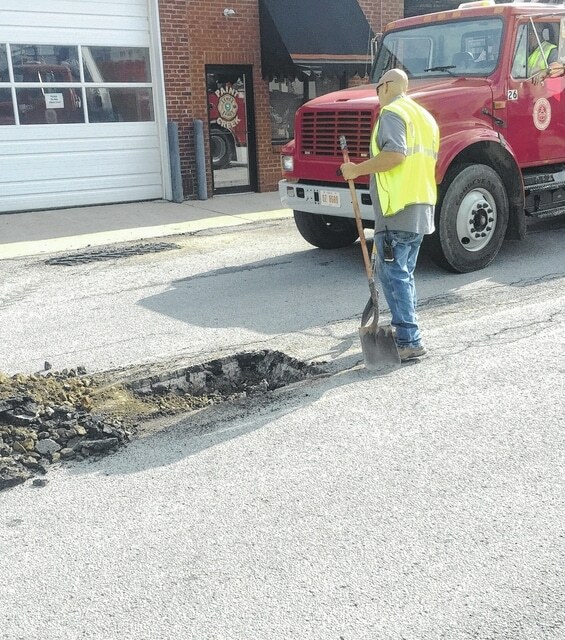 But Wilkin said he has spoken with a contact with the city of Cincinnati, where they recently tore up streets for new paving and uncovered tons of bricks that Wilkin said they might be willing to give to Hillsboro. “That would be great,” said Applegate, adding that such bricks would have the old, historic look the city hopes to include with the proposed plaza. At the final meeting of the design committee in March, Applegate said the plaza would have a historic theme and be designed to “look like it’s always been there.” She discussed the idea of an arch that would serve as the park’s entrance where Trimble meets North High Street. She said the name of the park might be determined by a public naming contest. The plaza would include an old-fashioned brick surface, and would feature trees planted in large circular containers that would double as seating areas. Additional benches could also be incorporated, said Applegate. A tall four-sided clock would be featured in the center of the plaza, with a stage area at the west side of the plaza on the edge of Gov. Foraker Place. In addition to eight trees within the plaza itself, another nine trees would be located around the courthouse grounds, with each of the 17 total trees representing each township in the county. Rocky Coss, who chaired the committee, said the entire plaza would consist of a “flat, level area” with “lighting consistent with the era.” The front courthouse lawn would be made more level to flow seamlessly into the plaza. The plan is designed to “make the area versatile for a number of uses,” said Coss. Two large trees were recently removed from the front of the courthouse due to concerns over infestation, and Tom Horst, a county commissioner and member of the plaza committee, said that at least one tree would not be replaced until the city determined whether to proceed with the plaza. Photo: A Hillsboro city street crew cut into portions of Gov. Trimble Place on Friday to see whether bricks still existed under the street. They found that the bricks had been removed.